NEW! With every purchase of this item, a 10% donation is made to cancer research. 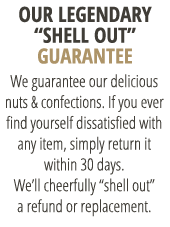 Our lightly Salted Virginia Peanuts mixed with candy coated chocolates to create a sweet/salty peanut treat. The nuts from the nut tins that I ordered for the holidays tasted great. I have to order more.I have been buying from you for years.